Cliff Thornton posed the question: could this painting, in the Jersey Heritage collection, depict the exploding Graham Island, which disappeared beneath the waves in early 1832? Graham Island rose from the sea between Sicily and Tunisia in 1831 as the product of a volcanic eruption and disappeared less than a year later. As the painting under discussion was completed in 1862, it might have been a retrospective depiction of the scene, although this would make it the only known night-time scene of the island. The artist, Philip John Ouless, was a prolific painter of ships, who recorded a number of sea-borne incidents. Both he and the vessel in the foreground of this painting were from Jersey. Jersey Heritage suggested that the vessel could be one of three brigs called 'Oliver Blanchard', built between 1822–1899 in Gaspe, Newfoundland, which were owned by Charles Robin & Co. and trading between Gaspe and Jersey. Ouless visited Gaspe in 1868, and his works were well-known in Nova Scotia. Pieter van der Merwe corrected the assumption that the ship depicted was a brig (it is in fact a full-rigged ship) and identified a 257-ton ship named 'Oliver Blanchard', owned by the company in 1834, as the vessel in Ouless's painting. It appeared the correct ship had been found. 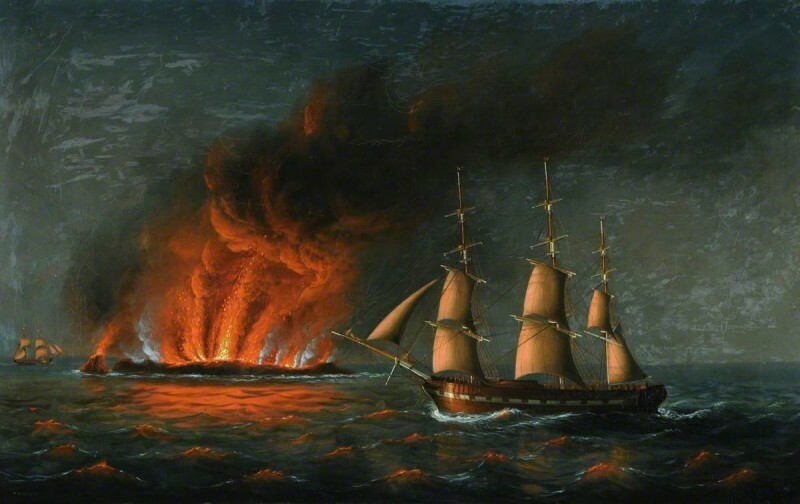 Consulting the 1831 Lloyds Register, Cliff Thornton discovered the ‘Oliver Blanchard’ traded between Liverpool, Trieste and Jersey, suggesting a route through the Mediterrenean which may have brought the ship in sight of the Graham Island eruptions. It was speculated that drawings made by its officers and crew may have reached Ouless. From the evidence, Pieter van der Merwe concluded that the vessel in the painting can be safely reidentified as the 257-ton 'Oliver Blanchard’ of Jersey off a volcanic island at night. There is circumstantial evidence to suggest that the island may be Graham island in 1831/2 – the recorded trade route of the 'Oliver Blanchard' and another oil image of Graham Island/Giulio Ferdinandea found by Pieter on the Smithsonian Institution vulcanology site both strongly support that. Less certain is the reason why Ouless chose to paint Graham Island 30 years after it sank into the sea. Does this painting depict the exploding Graham Island?